The rebel delegation meeting with representatives of the South Sudanese government in the Ethiopian capital Addis Ababa rejected the proposition that talks start without preconditions yesterday. The rebel delegation is sticking to the demand that those arrested last month following a reported coup attempt be released before any negotiations can proceed. The eleven detained individuals are referred to as the “Garang Boys,” as they are said to be former associates of John Garang, a hero of the Second Sudan Civil War, the outcome of which eventually led to the creation of independent South Sudan. They are said to not be outright associates of former Vice President Riek Machar, who President Salva Kiir has accused of orchestrating the coup attempt. The demand, which is rapidly becoming the most pressing issue, has brought the talks in Ethiopia, organized by the Intergovernmental Authority on Development (IGAD), an East African economic bloc, to a standstill. 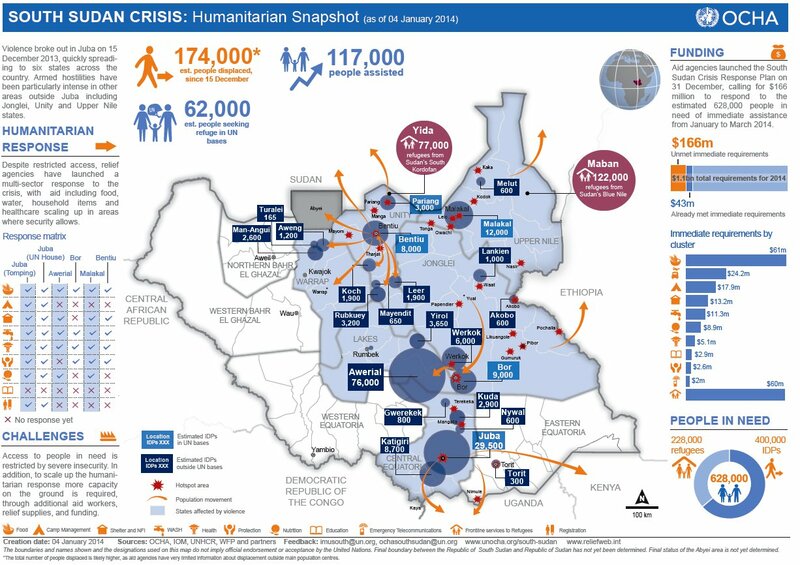 UN Office for the Coordination of Humanitarian Affairs Snapshot of the South Sudan Crisis, as of 4 January 2014. Fighting in South Sudan between predominantly ethnic Nuer rebels and government forces, primarily ethnic Dinka, continues in spite of the talks. Fighting was reported outside of Bor, which has been a flashpoint for weeks now, and civilians were reportedly fleeing their homes in Bentiu, an oil town near the South Sudan-Sudan border in Unity state. A portion of these individuals have sought shelter in the facility there operated by the UN Mission in the Republic of South Sudan (UNMISS). The UN Office for the Coordination of Humanitarian Affairs estimates that some sixty thousand individuals are currently sheltering in or near UNMISS facilities. The death toll from the conflict so far remains unclear. In a more positive development, the South Sudanese Army has reported that David Yauyau, another rebel leader who has been fighting the government in Jonglei state since April 2012, has agreed to a ceasefire. The agreement reportedly came after President Salva Kiir offered Yauyau an amnesty, but was not independently verified. South Sudanese authorities had already been negotiating with Yauyau before reported coup attempt with retired Catholic Archbishop Paride Taban acting as a mediator. In other related news, Uganda’s parliament summoned the Defense Minister to appear before them tomorrow to explain the deployment of Ugandan troops to South Sudan. Some parliamentarians in Uganda accuse President Museveni of violating the country’s constitution in deploying the troops without first seeking their approval. Others believe that the crisis warranted immediate action and could not wait for parliament, which was in recess at the time, to convene and make a ruling. Uganda deployed forces into the country last week, ostensibly to assist in the evacuations of Ugandan nationals. However, President Yoweri Museveni has also demanded that Riek Machar and Nuer rebels immediately agree to a ceasefire or face the threat of regional action. This entry was posted in Uncategorized and tagged Garang Boys, IGAD, South Sudan, Uganda, UNMISS, Yauyau. Bookmark the permalink.